This yoga fitness flow works out the thighs because of the repetitive transitions into Half moon pose. There is also a number of spinal alignment moves combined with core strengthening. The sequence begins with Plough pose done very lightly with the hands over the top of the head. These kind of poses can hurt the neck easily so you have to be careful when practicing them. Try stopping before the neck feels strain. Entering deeply too fast is asking for trouble. In the picture you can see that the upper body is not vertical but tilted so that the neck is not over-stretching. It may seem hard to get to Pigeon pose from the Boat pose but it actually flows quite well. Bend the knees and lean forward from Boat pose then lean slightly to the left hip. Allow the right leg to simply rotate out and back while aligning the bent left knee. Use the hands for support and be careful on the left knee as it is twisted and bent. It is often nice to combine hip stretches with hip strengthening poses. In this sequence the hips are stretched then strengthened then stretched again. one the top of the head. 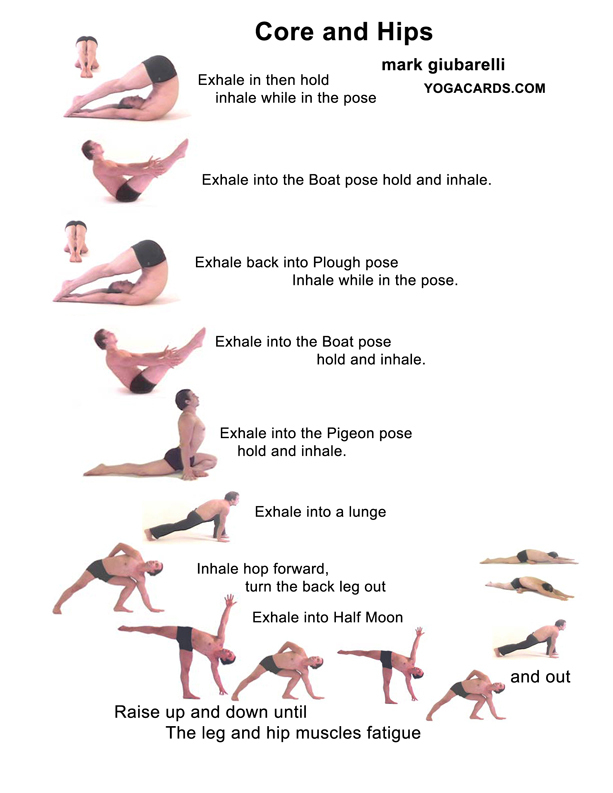 Inhale forward into the Boat pose. The legs can be slightly bent for an easier pose that still works the core. Exhale back again into the Plough pose. Hold and inhale. Exhale forward again into Boat pose. shown twice but do it until the core muscles fatigue. Hold and inhale. Exhale into Pigeon pose by bending the knees while leaning forward and towards the left hip. Bring the right leg back. 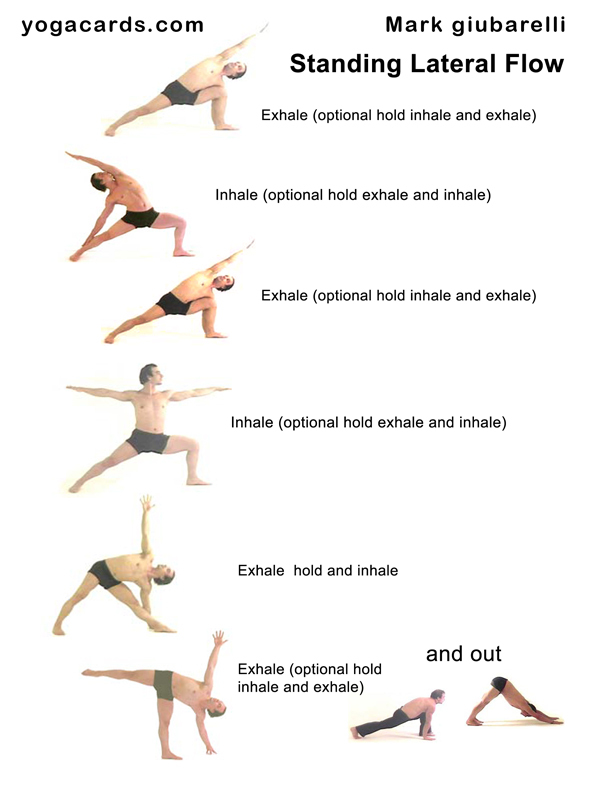 Inhale and exhale in this pose. Inhale into a lunge pose then hip the back leg forward halfway while turning it outward. Exhale and raise the leg up and inhale as you take it down. Repeat this motion breathing in and out as you raise the leg up and down until the hip muscles fatigue.